Here's 10 NFL stories bound to spark a lot of drama this season. Every NFL season has its share of drama. Unfortunately, with the Twitterverse and 24/7 media world, most of that drama happens off the field, as opposed to on. In the spirit of preseason predictions, I looked into my crystal ball and predicted 10 stories the sports media world will work itself into a frenzy over this season. 2. Wait three minutes for replay-booth review to confirm what was clearly a touchdown is actually a touchdown. 3. Wait three minutes to watch pointless PAT. 6. Another five-minute commercial break. 7. Next offensive drive starts. What stands out in that sequence as the only actual NFL action? The kickoff. And guess what there's going to be a lot fewer of this year? You guessed it, kickoffs. The average American viewer has the attention span of a gnat on a coke-binge, so do you really think they're going to wait 15 painful football-less minutes and not click around to one of their other 270 channels? I didn't think so, either. How The Drama Will End: A bunch of NFL execs with official-sounding titles will show up on talk shows and talk about how committed the league is to safety. And then they'll reinstitute the old kickoff rules by Week 10. How The Drama Will Start: Nnamdi Asomugha will get burned for a TD pass, Vick will miss two games and/or the Eagles will lose two games in a row. It's going to happen. 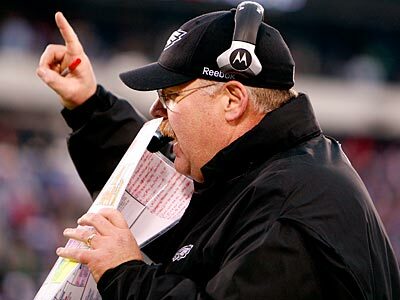 Asomugha will give up a TD pass or Vick will have a bad game or Andy Reid will accidentally lower his play sheet far enough below his mouth so that the opposing team reads his lips and know exactly which play he's calling next. And when it does, the media will turn on a dime and say the words "overrated" and "chemistry" more often than Al Davis says the word "braaaaiiiiiiins." The same people who called the Eagles a Dream Team will be baffled at how "everyone else" thought this "group of talented free-agents" could compete against "individuals who play like a team." How Will it End: The Iggles will rattle off 7 straight Ws, win the NFC East and be the team to beat in the NFL playoffs. How The Drama Will Start: Jay Cutler's face. How Will It End: Jay Cutler's face will continue to have that jock-smelling look if he throws a 75-yard TD bomb to Roy Williams (which would be difficult, since that would mean Roy Williams would have the ability to catch a football), or if he throws one of his patented red-zone drive-killing interceptions. People will realize that at some point and stop bothering him about his face. You know Goodell is waiting for this one. You can't call someone who has the ability to make your life a living and financial hell a "crook" and a "devil" and not expect a little blowback from the guy who also happens to be the most powerful man in football. Harrison should go ahead and send a $100,000 check to the front office and get it over with. How Will It End: Harrison will pay the fine and say all the right things through clenched teeth at a post-fine press conference as a smiling Dan Rooney holds a gun to his back. How The Drama Will Start: A starting quarterback will get injured. For some reason the idea of Brett Favre throwing a football in tight pants turns grown men into little girls. The moment a starting quarterback goes down this season, the media Twitterverse will freak out with tweets like "OMG, Brett Favre shuld B My Team's BFF!" or "@BrettFavre u wuld make our qb dreams come tru". But this is the year Favre finally says "STFU, I Like Mowing On A Tractor Now" Then Carson Palmer will tweet, "Hey guys, still on my couch. Hello? Hello?" And that's when I will "LOL." How Will It End: Brett Favre ain't coming back, people. Deal with it. How The Drama Will Start: Plax will blow a 2.4 BAC on Riverside Drive early one early October morning. How Will It End: Plax will make the walk of shame out of a Manhattan courthouse, wearing sunglasses and being hounded by reporters. The media will get on its high horse until a starting QB gets injured and they forget about Plax and start drooling over Favre again. How The Drama Will Start: Kyle Orton (aka Judas Orton) throws an interception. Tim Tebow's already numerous (and loud) disciples have put Big Time Timmy Jim in the football Hall of Fame already. They are just waiting to pounce on Orton once he makes a mistake or could remotely be blamed for a Broncos loss. How long will the Broncos, who've shelled out $6 million to the Timster let all that cash just sit on the bench? That's a very expensive cross to bear. How Will it End: Orton will remain the starter and Tebow will stay a very expensive pine-rider all season who sees some QB-sneak and goal line work, but nothing more. Another "incident" will happen at the Oakland-Alameda County Coliseum and Fox will start filming every Raiders game like an episode of Cops, with handheld cameras chasing thugs down in the stands and getting blurry footage of fat guys trying to punch each other and hold $9 beers at the same time. You'll have to check the box score to see who won the actual game. How The Drama Will End: Every Bay area football fan will end up in prison, the hospital or the morgue. How The Drama Will Start: The "loaded" Texans will go 8-8...again. Do any of these proclamations sound familiar: "This is their year! ", "The Texans are definitely going to do it this year! ", "The Texans have all the weapons to be Super Bowl contenders!" Well, they should, because the sports media has been shouting them at you for the last five years. But THIS YEAR is REALLY the year. We promise. How Will The Drama End: The Texans quiet the critics and not only make the postseason, but win a playoff game. Or Kubiak gets fired this time. No, really. How The Drama Will Start: A couple high profile players will get busted for HGH. With the new CBA rules testing players for HGH this year, there's no doubt that a few high profile players are bound to get busted. But since this isn't baseball, the media will get worked up about these roid busts for about a week, and then go back to not caring which players are juicing and which ones aren't. Members of the baseball media world will continues to watch the double standard with a baffled and irritated look on their faces. How The Drama Will End: Three days will pass after the juicers are busted and the whole subject will quietly go away.